On a hot July day, Garrick and Olivia Lockwood and their two children move into 25 The Avenue looking for a fresh start. They arrive in the midst of a media frenzy: they’d heard about the local murders in the press, but Garrick was certain the killer would be caught and it would all be over in no time. Besides, they’d got the house at a steal and he was convinced he could flip it for a fortune. The Neighbour unfolds from a few points of view and goes back and forth across a short period of time. Cummins puts us in the heads of several of the residents of The Avenue, including that of the killer. Of course (as they’re the only ones narrating in first person in the ‘now’) we don’t know exactly who that is, though they take us back in time to their childhood and ill treatment at the hands of an adopted mother. And there’s a pivotal event in 1985 referenced in the prologue and on a few occasions by our killer. We meet DS Stanton at an inopportune time. For her. And not long after the fifth murder (which has occurred as the book opens) she and her boss are essentially removed from the case; but it won’t stop Wild from investigating now that it’s become personal. Of course so many of the neighbours have secrets, including the Lockwoods who are escaping financial pressure and infidelity, and then there’s the postman who’s spending an inordinate amount of time in the street. This is an enjoyable read. It started a little slowly but becomes quite intriguing. We’re offered some obvious suspects and red herrings before the final ‘reveal’, and its twists and turns stepped the rating of this book up a notch (from a 3.5 to 4 star read) for me. 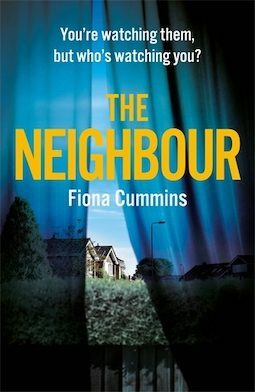 The Neighbour by Fiona Cummins will be published in Australia by Pan Macmillan and available from 9 April 2019. I received a copy of this book from the publishers for review purposes.